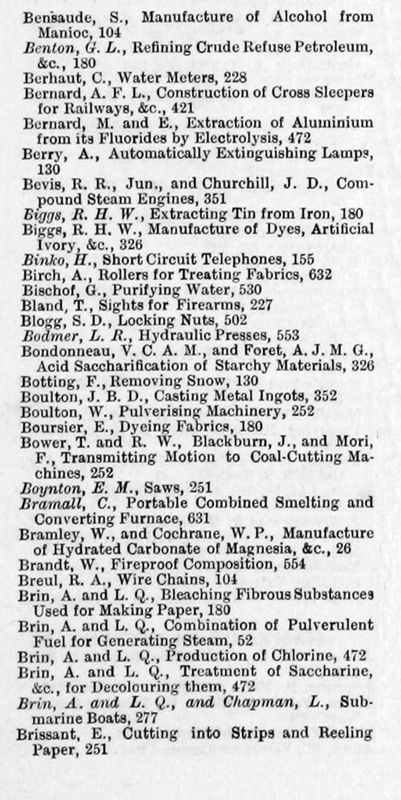 Engineering 1888 Jan-Jun: Patent Record Index. Distribution of Currents of Electricity, R. E. B. Making and Breaking Electric Circuits, S.
Spinning and Twibting Machines, Driving, A.
Thermo-Electric Elements and Piles, R. J.
T. and R. %V. Bower, J. Blackburn, and F.
Fire Hose, J. C. Merryweather and C. J. W.
Boilers with Corrugated Flame Tubes, A. Mounting and Working Disappearing Guns, A.
Mantles for Incandescent Gas Lighting, A. Automatic Apparatus for, T. Kirkland and T.
Manufacture of Cast Steel, F. H. Lloyd and H.
Production of Carbon Filaments, La Societe A. Recording Music from a Pianoforte, &c., C. H.
Washing Ores, M. Kennedy and G. Green, 631. Manufacture of Kieselguhr; Dynamite, E.
Treatment of Explosive Compounds, H. S.
Utilising the Force of Explosion Gases, W.
of a Cornish Pumping Engine, Anne and J. Deep Well, V. Morris, 251. Heating Railway Carriages by Steam, J. 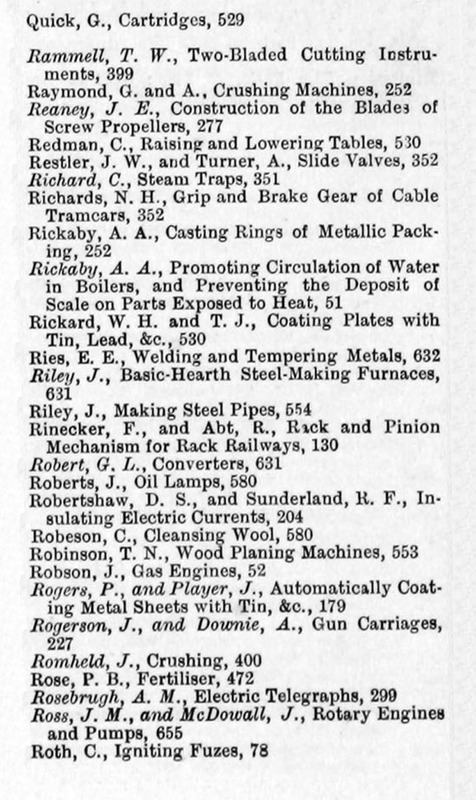 Iron and Steel Sleepers, J. Cabry and W. H.
Rails Obviating the Use of Fish-Plates, W. E.
Sleepers, D. C. Heller, R. W. Flower, and S.
Centre Buffing and Coupling Apparatus, F. 11. Automatically Controlling Electric Circuits, G.
Applying Armour Plates, T. Osborne, C. Ll. Supporting and Feeding Torpedoes, W. C.
Cleaning Tramway Lines, S. Strange, J. Guard Alarms Worked by Compressed Air, A. Snow Plough and Gravel Distributor, A. Automatic Switch for Electrical Circuits, T.
Cutting into Strips and Reeling Paper, E.
Manufacture of Arms and Projectiles, W.
Punching by Explosive Gaseous Mixtures, C.
Punching and Rivetting, R. H. Tweddell, J. Rack and Worm Mechanism, W. Smith, D.
Shears and Gripping Instruments, T. W.
Tramcar Guard to Prevent Accidents, T. B.
Low-Pressure Indicators, J. B. Stubbs and J.
Harman, F. B. M., Compound Steam Engines, 351.